FISH: Ben Holtzman: Machine Listening reveals cyclic change in seismic source spectra in the Geysers geothermal field, California; can we learn to hear changes in the thermal-mechanical state? 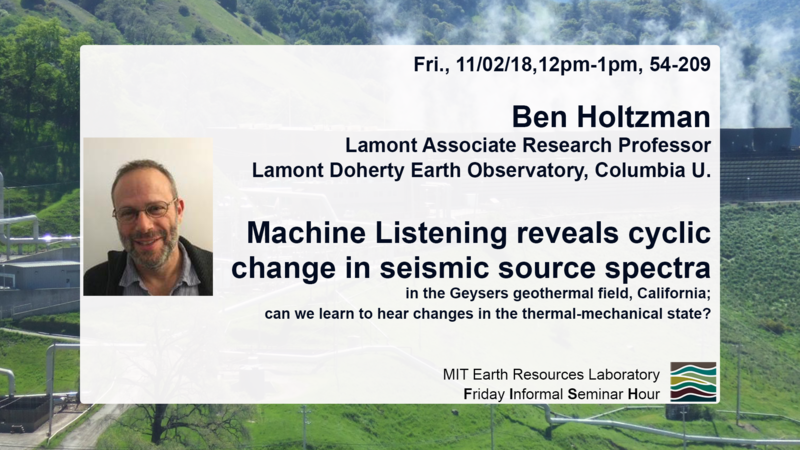 + Add to my Calendar America/New_York 11/02/2018 12:00 PM 11/02/2018 1:00 PM FISH: Ben Holtzman: Machine Listening reveals cyclic change in seismic source spectra in the Geysers geothermal field, California; can we learn to hear changes in the thermal-mechanical state? Dr. Ben Holtzman, the Lamont Associate Research Professor at Lamont Doherty Earth Observatory, Columbia U., presents "Machine Listening reveals cyclic change in seismic source spectra in the Geysers geothermal field, California; can we learn to hear changes in the thermal-mechanical state?" at the MIT Earth Resources Laboratory.